701 Union Street, a boutique residential development in Park Slope, has resumed work on-site with a new architect on record. 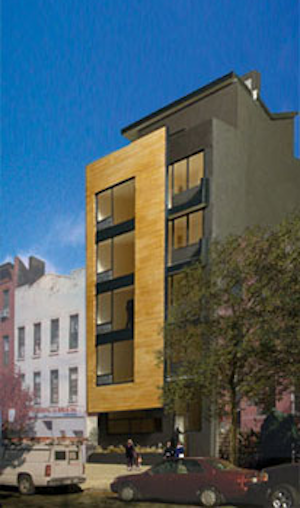 Jeffrey McKean Architects filed a building application in January for a nine-unit structure, and the Department of Buildings issued a new permit for the project in February, Brownstoner reported. The six-story development will include apartments ranging from studio lofts to two-bedroom penthouses, according to the architect’s website, which also contains a rendering. Each unit will have balcony space; ground-floor units and the penthouses will have access to exterior garden or roof space. A wood plane will “cantilever” out from the upper-floor living rooms, allowing for large windows and more room. Construction signage says that new financing for the project arrived from Valley National Bank, Brownstoner reported.